Mimi Stuart's art career could have been a short one, thanks to a college teacher who insisted she was not an artist. Thankfully, she had an unflagging admirer, a man who later became her husband, who had seen the posters she had created for concerts and plays at the University of California-Berkeley and insisted she keep on. The signature style that Stuart eventually developed, a style she calls "Energy of Subject" has taken her on an incredible journey. Mimi used it to capture the essence of some of the world's best-known people, including Robin Williams, Alberto Tomba, Kenny Loggins, Prince, Peter Frampton, Harrison Ford and Lyle Lovett—musical notes streaming through his trademark big hair. She's been commissioned to paint pieces celebrating the anniversary of Apollo 11, the PGA Golf Tour and Living Legends at the Beverly Hilton. Stuart had her art installed in the Smithsonian's National Air & Space Museum, New York's Times Square and Apollo 11 Astronaut Buzz Aldrin's home. And her work has been seen in Budweiser commercials and Nash Bridges, among other things. Sun Valley residents and visitors got a treat earlier in July when they got to see Stuart at work in her studio during the free Wood River Valley Studio Tour. Stuart was one of 50 artists who entertained visitors in their studios. A walk through Stuart's home besides a waterfall-fed pond filled with koi shows the evolution her art has taken since she got her Master degree at the Art Center College of Design in Pasadena. There are detailed pen and ink sketches of historical buildings she used to draw for the Los Angeles Times. There are realistic landscapes, including a portrait of a young Honduran boy whose eyes follow those walking up and down the stairs. 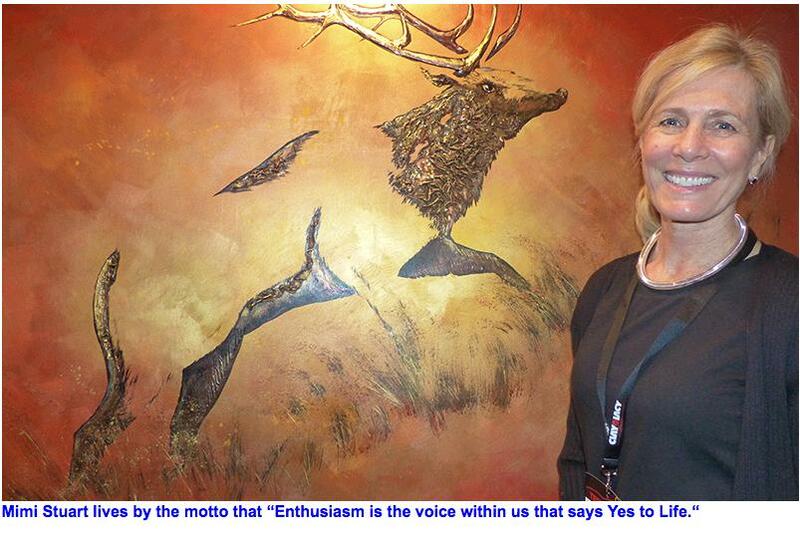 And, then there's the freestyle flourishes that led "Art Business Magazine" to call her "the artist of energy"
Her evolution is expressed best in a representational painting of snow-covered mountains near Squaw Valley. It's juxtaposed with a painting featuring those same mountains only in yellows and oranges and zigs and zags that pulsate with the energy and rejuvenation one feels in nature's grandeur. "People say, 'What artist did this?' 'What artist did that?' And they're all Mimi," said Charlie Stuart. "Even the doodles she did on her biology and math papers were masterpieces." Stuart's "energy of subject" paintings start not with a plan but a feeling. Mini transforms the vibrant colors that she sees in her mind as she listens to music into abstract musical symbols and notes. When asked to paint portraits, the aura Stuart feels from her subject flows out her paintbrush. 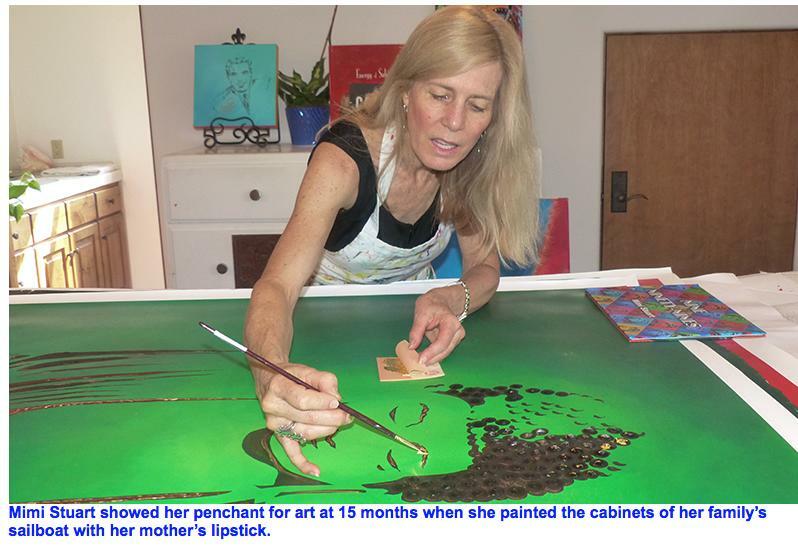 That nearly backfired when she was asked to paint a portrait of Actress Glenn Close for a fundraiser for Robert F. Kennedy Jr.'s Waterkeepers Alliance environmental organization. Despite Close's femme fatale persona in "Fatal Attraction," her personality came out in shades of pale yellows, pinks and greens. That was all well and good until the benefit's organizers changed the honoree to actor Alec Baldwin. "He was not pastel. He was bright red, bold orange," Stuart said. The tale of that painting took yet another twist when someone walked away with it shortly after bidding. The bidder insisted he didn't want his money back, he wanted the painting back. Finally, organizers placated him by inviting him back the following year at which time they'd have another painting of Baldwin painted by Stuart. "Things seemed to be going well until they asked Alec to sign the painting," Stuart recalled. "I had a special pen for signing but someone gave them another pen and he pressed so hard that a big glob of ink started running down the painting. Someone said, "Look at the blob!" And someone else said, "That's Alec's blob." And the owners said, "We like Alec's blob." So, everything turned out okay. Stuart has painted series saluting the evolution of aviation, fly girls, golfers, innovators like Steve Jobs and Galileo and what she's dubbed the "Evolution of Consciousness"—her tribute to the people who have made a difference in the world, such as Martin Luther King, Gandhi and Nelson Mandela and Mother Theresa. 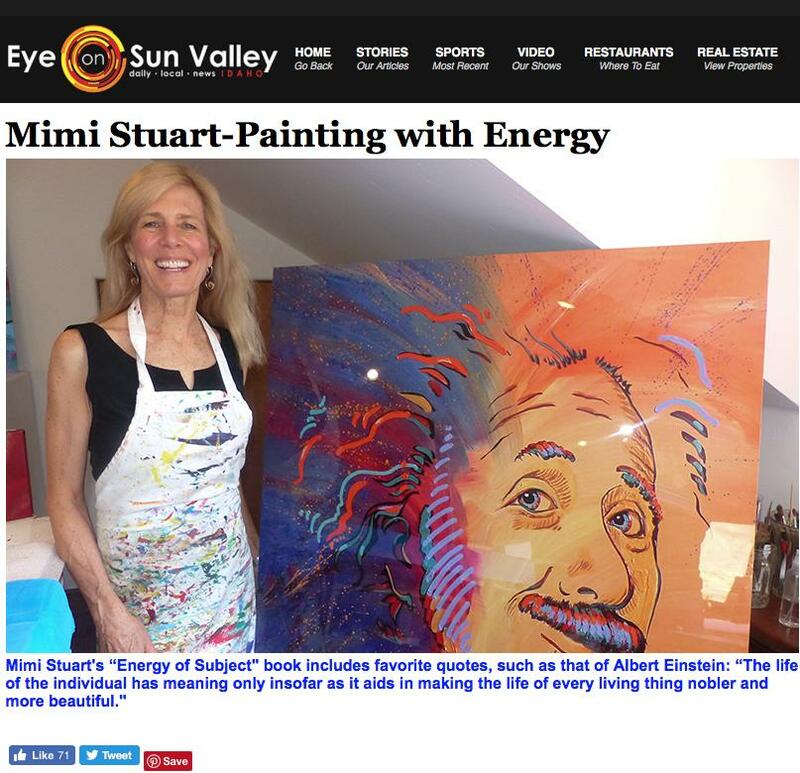 She has poured a lot of energy into a series on Albert Einstein, who said, "Personally, I experience the greatest degree of pleasure in having contact with works of art. They furnish me with happy feelings I cannot derive from other sources." Stuart often does her best work between the hours of 10 p.m. and 4 a.m.—the hours feeling like moments she's so absorbed in what she's doing. She paints her subjects with abandon, splashing expressionistic lines and bold colors that pulsate on the canvas. As the image takes shape, Mimi painstakingly adds bursts of energy via 24-karat gold, silver and copper leaf. 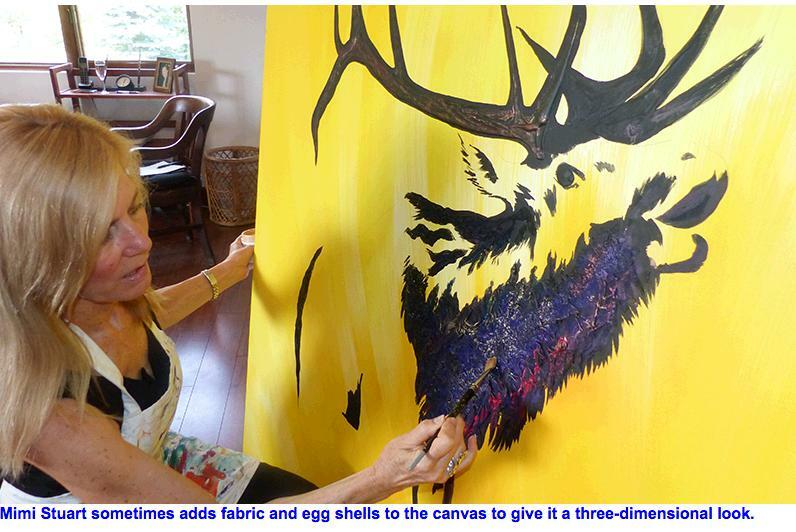 Occasionally, she adds fabric and even egg shells to the canvas to give it a three-dimensional look. She often works with negative space, sketching out a person's eyes and mouth in pen and ink. When Mimi's finished, it's impossible to see the person—say, the Dalai Lama looking back, his eyes crinkled in his signature smile, despite the minimalist approach. "My realistic painting takes immense concentration to make a faithful reproduction, so it's fun to do something big and wild and fun to balance it out," she said. "I like the shift from detail to freedom of expression." The expression is what's important, Stuart added. "If the eyes are right, everything else follows. I was commissioned to do some work for the Tuskogee Airman's Museum. When they had the opening, a colonel walked up to one of the pieces and said, "Why, that's Sparky!" These weren't historical figures out of a book. These were his friends!" Morgan Freeman had the same reaction when Stuart painted his portrait for the Ground Zero Blues Club in Clarksdale, Miss. Told that he could hang the portrait anywhere he wanted, he took it straight to his fireplace mantel. After living in both New York and California, Charlie and Mimi Stuart moved to the Wood River Valley in 2013 following in the steps of Mimi's sister Alison Poulsen. The light, landscape and energy of this valley has only stoked Stuart's creative passion. "We knew winters were fantastic but we figured summers would be boring. But what more fabulous place to be!" said Mimi. "We've lived on both coasts and we loved both, but we're glad we saved the best for last!" In her new home, Stuart is embarking on a new series inspired by a Japanese Kintsugi, the Japanese art of repairing broken pottery with a lacquer. The idea is not to disguise a broken piece but to embrace the imperfect as part of the life of the object. "They accentuate the break, with the idea that's it strongest where the break occurred,' she said. "It says there's strength and beauty in scars, strength and beauty in parts that have been broken and patched up again. It says there's strength and beauty where friends help you get back up again. And that's the excitement!" Mimi Stuart is unflagging in her insistence that people think twice before discrediting art, thanks to her own experience with that college teacher so long ago. She loves reading Irving Stone's biographies about people like Michelangelo and Pizzaro who were told they couldn't or shouldn't do something but went ahead and excelled in their passion. When asked to give a talk about success to high school students, she compared and contrasted two self-portraits she hid behind black cloth. "They wanted to know how much I made and how many hours I worked. But art is not about numbers. I told them how artist A got horrible reviews and never sold a painting during his lifetime. The painter under the other cloth was very successful, his art bringing in millions of dollars." Stuart tore off the black cloth to reveal two self-portraits of Van Gogh—the painter who couldn't sell a painting in his life time and the painter whose paintings have sold for millions since his death. "The point being, you can't judge talent by financial success," she said.